Franz Ignaz Danzi, cellist and composer, was born on June 15, 1763 in Schwetzinger, Germany and died on April 13, 1826 in Karlsruhe, Germany. His father, cellist Innozenz Danzi (1730-1798) was one of the highest paid musicians of the famous Mannheim Orchestra. Franz began playing cello with that orchestra in 1778, eventually succeeding his father in 1783 (in Munich). In 1807 Franz became Kapellmeister in Stuttgart where he became good friends with Carl Maria von Weber, 23 years his junior (born 1786 - ironically, Weber died on June 5, 1826, less than 2 months after Danzi). 3 Potpourris for Clarinet and Orchestra, Op. 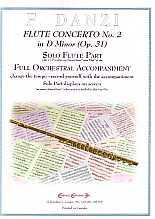 45 (1814) and a Concertante in Bb Major for Flute and Clarinet (and Orchestra) Op. 41 (1814). and 9 Woodwind Quintets (Flute, Oboe, Clarinet, Bassoon and F Horn), a medium he is often credited with inventing.